THE MAKING OF A NATION – a program in Special English by the Voice of America. Soon after the Civil War ended in 1865, thousands of land-hungry Americans began to move west. The great movement of settlers continued for almost forty years. The great empty west, in time, became completely settled. 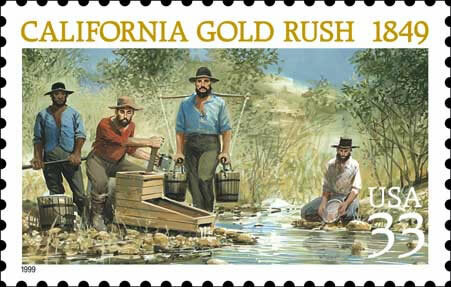 The discovery of gold had already started a great movement to California. Men had rushed to the gold fields with hopes of becoming rich. A few found gold. The others found only hard work and high prices. When their money was gone, they gave up the search for gold. But they stayed in California to become farmers or businessmen or laborers. Some never gave up the search for riches. They moved back toward the east, searching for gold and silver in the wild country between California and the Mississippi river. Men found gold and silver in Nevada, and then in the Idaho and Montana territories. Other gold strikes were made in the Arizona territory, in Colorado and in the Dakota territory. Each new gold rush brought more people from the east. Mining camps quickly grew into towns with stores, hotels, even newspapers. Most of these towns, however, lived only as long as gold was easy to find. Then they began to die. In some of the gold centers, big mining companies bought up all the land from those who first claimed it. These companies brought in mining machines that could dig out the gold from deep underground and separate it from the rock that held it. These companies needed equipment and other supplies. Transportation companies were formed. They carried supplies to the mining camps in huge wagon trains pulled by slow-moving oxen. Roads were built, and in some places, railroads. The great wealth taken from the gold and silver mines was usually invested in other businesses: shipping, railroads, factories, stores, land companies. More jobs were created in the west. And living conditions got better. More and more people decided to leave the crowded east for a new life in the west. But the big eastern cities continued to grow. New factories and industrial centers were built. People moved from the farms to find work in the cities. The growth of these industrial centers created a big demand for food, especially meat. Chicago quickly became the heart of the meat industry. Railroads brought animals to Chicago, where packing companies killed them and prepared the meat for eastern markets. Special railroad cars kept the meat cold, so it would remain fresh until sold. As the meat industry grew, the demand for fresh meat increased. More and more cattle were needed. There were millions of cattle in Texas, but no way to get them to the eastern markets. The closest point on the railroad was Sedalia, Missouri, more than one thousand kilometers away. Some cattlemen believed it might be possible to walk cattle to the railroad, letting them feed on the open grassland along the way. Early in 1866, a group of Texas cattlemen decided to try this. They put together a huge herd of more than two hundred sixty-thousand cattle and set out for Sedalia. There were many problems on that first cattle drive. The country was rough; grass and water sometimes hard to find. Bandits and Indians followed the herd trying to steal cattle. Farmers had put up fences in some areas, blocking the way. Most of the great herd was lost along the way. But the cattlemen believed they had proved that cattle could be walked long distances to the railroad. They believed a better way to the railroad could be found, with plenty of grass and water. The cattlemen got the Kansas Pacific Railroad to extend its line west to Abilene, Kansas. There was a good trail from Texas to Abilene. Cattlemen began moving their herds up this trail across the Oklahoma territory and into Kansas. At Abilene, the cattle were put on trains and carried to Chicago. In the next four years, more than one-and-a-half-million cattle were moved north over the Chisholm trail to Kansas. Other trails were found as the railroad moved farther west. Trail drives usually began with the spring "round-up." Cattlemen would send out cowboys to search the open grasslands for their animals. As the cattle were brought in, the young animals were branded -- marked to show who owned them. Then they were released with their mothers to spend another year in the open country. The other cattle were put together for the long drive to Kansas. Usually, they were moved in groups of twenty-five hundred to five thousand animals. Twelve to twenty cowboys took them up the trail. The cowboys worked hard on a trail drive. They had to keep the herd together day and night and protect it from bad men and Indians. They had to keep the cattle from moving too fast or running away. If they moved too fast, they would lose weight, and their owner would not get as much money for them. The cowboys would walk the cattle only twenty to thirty kilometers a day. The cattle could feed all night and part of the morning before starting each day. If the grass was good, and the herd moved slowly, the cattle would get heavier and bring more money. In the early 1880s, the price of cattle rose to fifty dollars each, and many cattlemen became rich. Business was so good that a five thousand dollar investment in the cattle industry could make forty-five thousand dollars in four years. More and more people began raising cattle. And early cattlemen greatly increased the size of their herds. Within a few years, there was not enough grass for all the cattle, especially along the trails. There was so much meat that the price began to fall. There were two severe winters that killed hundreds of thousands of cattle. An extremely dry summer killed the grass, and thousands more died of hunger. The cattle industry itself almost died. Cattlemen also had problems with farmers and sheepmen. Farmers coming west would claim grassland used by the cattle growers. They would put up fences and plow up the land to plant crops. 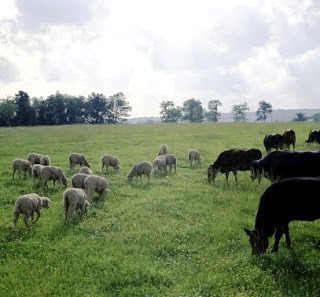 Other settlers brought huge herds of sheep to compete with cattle for the grass, and the sheep always won. Cattle would not eat grass where sheep had eaten. Violence broke out. Cattle growers fought the farmers and sheepmen for control of the land. The cattlemen finally had to settle land of their own, putting up fences and cutting the size of their herds. 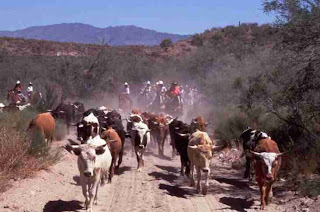 They no longer could let their cattle run free on public lands. By the late 1800s, the years of the cowboys were ending. But the story of the cowboy and his difficult life would not be forgotten. Even today, the cowboy lives in movies, on television, and in books. When one thinks of the "wild west" of America, he does not think of the miners who opened the way to the west. Nor does he think of the men who struggled to build the first railroads across the wild land. And one does not think of the farmers who pushed slowly westward to fence, plow, and plant the land. The words "wild west" bring to mind just one character: the cowboy. His difficult fight to protect his cattle on the long trail was an exciting story. It has been told by many writers. Perhaps the best-known was a young easterner, Owen Wister. He worked as a cattleman for several years, then wrote about the heroic life of the cowboy in a book called "The Virginian." Another easterner who came west to learn about the cowboy was the artist Frederick Remington. Remington was a cowboy for only two years. But he spent the rest of his life painting pictures of the west and writing about it. His exciting works made the west and the cowboy come to life for millions who never saw a real cowboy. The cowboy has also lived in music. He had his own kind of songs that told of his problems, his hopes, and his feelings. That will be our story next week. You have been listening to the Special English program, THE MAKING OF A NATION. 1. The center of meat packing in the United States after 1865 was __________ . 2. 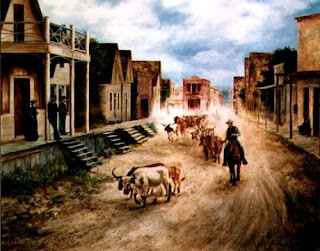 The Chisholm Trail shortened the dangerous cattle drive. It ran from ___________________ . 3. The search by the cowboys for their cattle before the drive was called the "______________." 4. The growth of industrial centers created a big demand for food, especially _____________ . 5. Mining camps became towns. The towns lasted ___________________ . 6. Unfortunately, gold was not discovered in _______________________ . 7. Cowboys had to keep the herd from moving too fast. If the cattle moved too fast, ______________________ . 8. The story of the cowboy _________________ very popular in movies, television, and in books for a long time. 9. The first cattle drive had many problems. For example, ____________________ . 10. If a gold seeker in California did not find gold and ran out of money, he sometimes ___________________ .